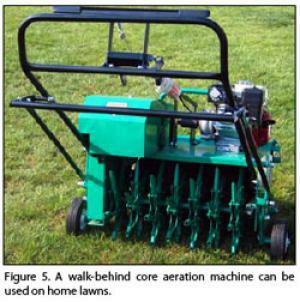 Aerate lawns with a core aerator. Core aerators have hollow metal tubes or tines that remove plugs of soil. Avoid spike-type devices that simply punch holes (compacting the soil) in the ground. Core aerators are often available at rental agencies. If you prefer not to do it yourself, core aeration is a service provided by most professional lawn care companies. Remove soil cores that are approximately three-fourths of an inch in diameter and 3 inches long. For best results, aerate lawns when the soil is moist. Avoid aeration when soils are dry or wet. The tubes or tines will not be able to penetrate deeply when the soil is dry and may get plugged with soil when the soil is wet. In dry weather, thoroughly irrigate lawns 2 days prior to aeration. Lawns that are properly aerated should have 20 to 40 holes per square foot. Since most core aerators won't remove the proper number of holes with a single pass, several passes are usually necessary. Aerate the lawn in at least two different directions. To help promote recovery of the lawn, fertilize the lawn one week prior to aeration and irrigate the lawn after aeration if the weather is dry. If the lawn is thin, grass seed can be sown after core aeration. Early September is also an excellent time to overseed an existing lawn. For more information on overseeding, see the article from July 29, 2016. How often should I aerate a lawn? What is the proper way to aerate a lawn? What are the benefits of aerating the lawn?